bcd hostel ... This place wa generally alright,there was just a little problem when we came down there with reservation but it was sort out quickly.I can fully recommend this place as i spent there a really nice time. - NIGHT FROM 8 EURO! !! !THE 7TH NIGHT IS FOR FREE!!! 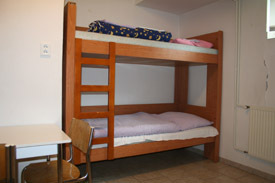 Hostel Suchdol is located at famous place for youth accommodation in Prag. Reception of Hostel Suchdol is situated in building A or F at the begining of student city about 2 min walk from the bus stop. It has a newly renovated capacity of 120 beds during the summer holiday and 60 beds dutiny the year. 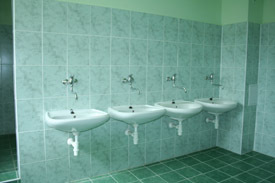 Hostel offers simple, but convenient and clean single and double rooms with own showers and toilets in the room. Situated in the one of the green parts of Prague - part Suchdol. Very good connection to the town center by bus which goes each 5 min from the hostel to the underground stop " Dejvicka " Suitable for everybody who is looking for pleasant cheap accommodation. Supermarket, bank machines, bars, restaurants, post office, night clubs, and pubs nearby. 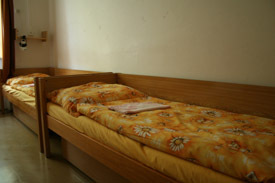 It has a newly renovated capacity of 200 beds during the summer holiday and 100 beds dutiny the year. 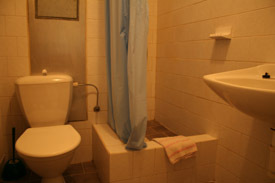 Hostel offers simple, but convenient and clean single and double rooms with own showers and toilets in the room. You can reach us if you will take an underground - RED LINE \"C\" and then change the line at the station called MUZEUM to GREEN LINE, then take metro to the direction of Dejvická, which is the laststop, get off and then take bus number 107 or 147 and get off at \"Zemedelska univerzita\" stop , then It takes you just 2min to walk to the Hostel, which is situated about 200m from the stop in building marked with BCD. You need to buy a ticket of 20 CZK for this travel. This ticket´s transfer and validation is 75 minutes. Take the bus number 119 and get off at Dejvická station and then také the bus number 107 or 147 and get of at \"Zemedelska univerzita\" stop, then It takes you just 2min to walk to the Hostel, which is situated about 200mfrom the stop in building marked with BCD. Nearest airport: Prague - Ruzyne, 35 min by bus, 20 min by taxi.